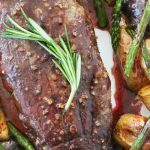 Reverse Sear Filet Mignon with Champagne Butter Sauce sounds fancy but is surprisingly simple to prepare at home. Thank you to the Ohio Beef Council for sponsoring this recipe, as always all opinions are mine alone. 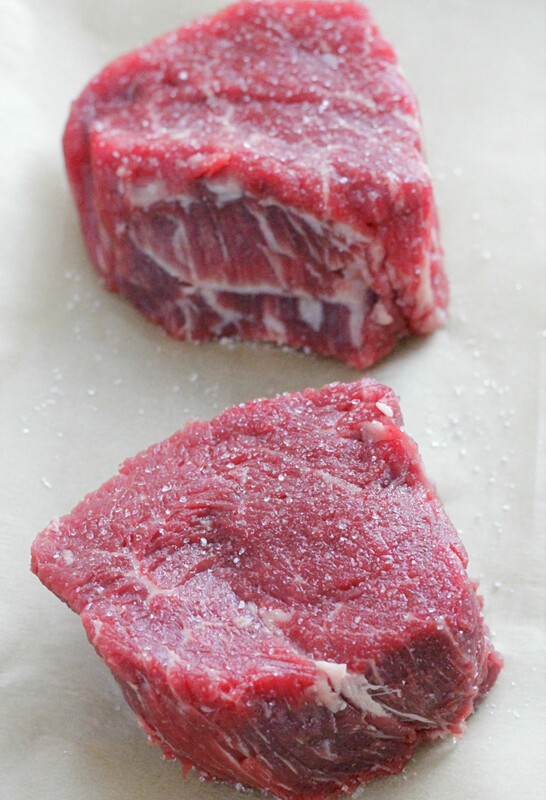 The reverse sear method is my favorite way to cook meat at home, especially a pricier cut of beef like a tenderloin or filet mignon steaks. Bringing up the internal temperature of the beef slowly in the oven and then finishing it with a quick sear in a hot skillet ensures even cooking throughout and a better control of the final temperature. 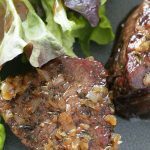 In general filet mignon is best served at 140 degrees F – medium rare – and reverse searing helps to take the guess-work out of getting that final temperature just right. 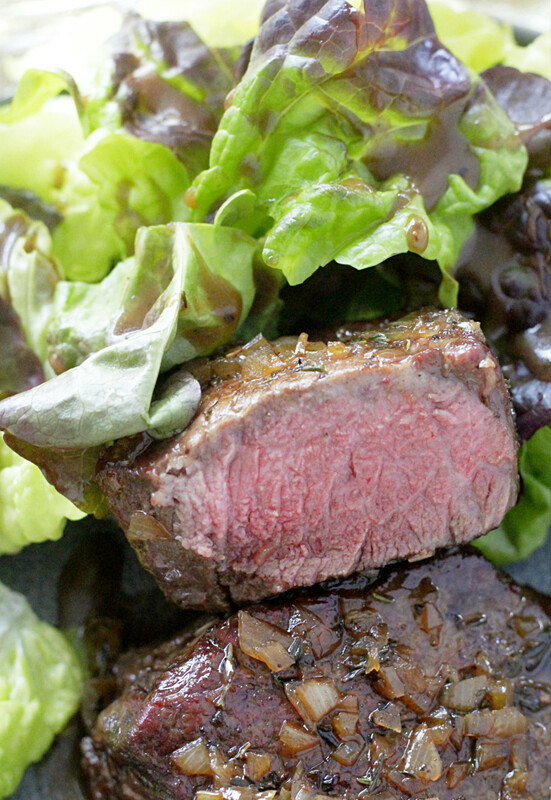 You’re going to love this Reverse Sear Filet Mignon with Champagne Butter Sauce. 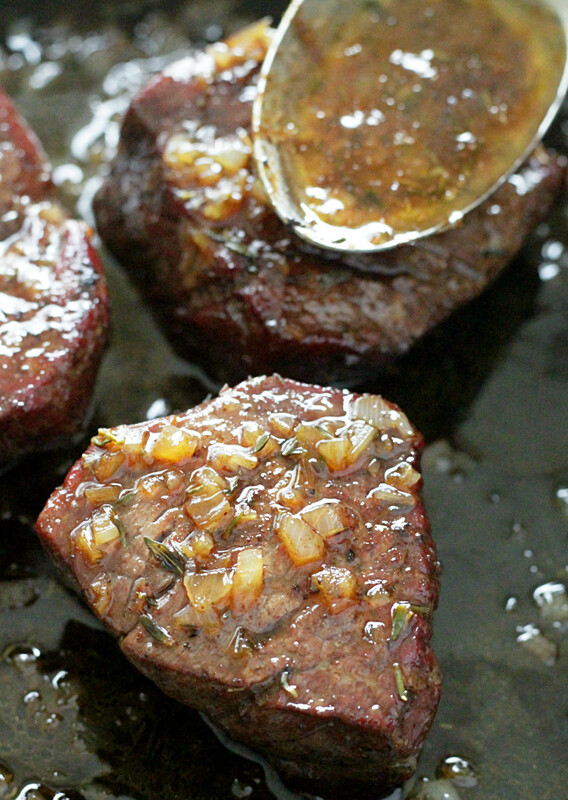 Ohio Beef asked me to create a Valentine’s Day recipe that is perfect for a date night at home. My immediate thought went to champagne so my reverse sear filet mignon steaks are finished with a champagne butter sauce. A lot of the recipes I researched for this sauce called for fresh lemon juice which seemed like it would clash with the champagne flavor. I’ve used pineapple juice in beef recipes before so I decided to try it in this sauce. I tasted both the champagne and canned pineapple juice one right after the other to compare flavors and the slight sweetness of both definitely compliment each other. I used a dry, Pinot Grigio type of champagne for this recipe. Besides including Valentine’s Day February is American Heart Month. It makes sense, right? Your heart will thank you for eating beef. Research shows that enjoying lean beef as part of a heart-healthy diet can lower cholesterol and reduce heart disease risk. Plus beef is delicious, just ask my daughter. Steak is her favorite food. Besides promoting beef for its taste and healthful benefits I enjoy creating beef recipes because raising beef employs 17,000 beef farming families here in Ohio alone. Ohio beef farmers take care of their animals all year long, even when the weather outside is harsh. Watch this short video to see how the Rittenhouses, beef farmers from New Carlisle, work to get their cows to a nearby pasture, where they can watch over them closely, as a winter storm approaches. 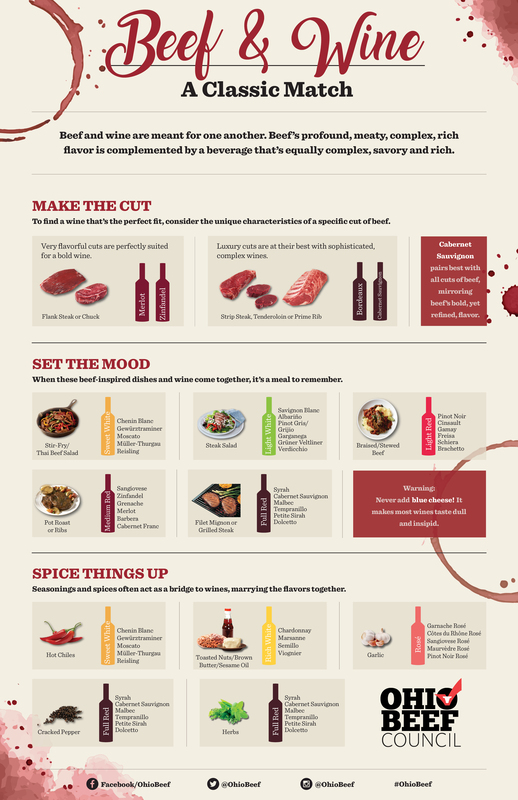 This recipe will have your date thinking you are a gourmet chef. He or she doesn’t have to know how simple it actually is. Having a digital meat thermometer like this one is helpful in knowing when to remove the filet mignon steaks from the oven (at 130 degrees F). 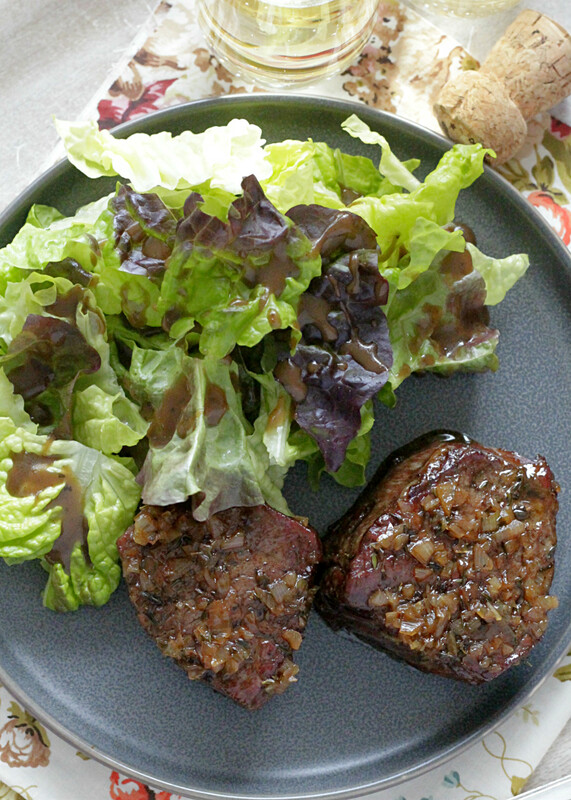 Serve these steaks with a simple green salad and a decadent chocolate dessert like this one. Enjoy! 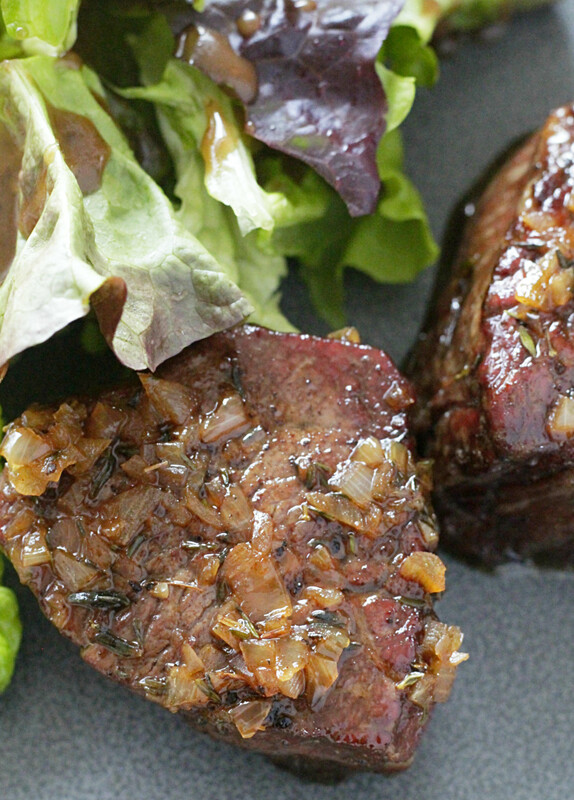 Reverse searing guarantees perfectly cooked filet mignon steaks. They are finished with a champagne butter sauce. Remove the steaks from the refrigerator 30 minutes before baking. Pat dry with paper towels and salt both sides of the steaks with the one teaspoon of salt. 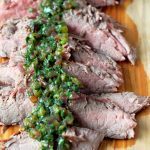 Place the steaks on a baking sheet lined with parchment paper. Bake until the internal temperature of the steaks reads 130 degrees F. Start checking the temperature after about 20 minutes of baking. Remove from oven. Heat the butter over medium-high heat in a skillet. Add the steaks and sear both sides until browned, 1-2 minutes per side. Remove the steak to a clean plate and tent with foil. Reduce heat to medium and add the shallots, thyme and salt. Cook stirring often for about 2 minutes. Add the champagne and pineapple juice. Bring to a boil and cook for about 1 minute more, or until sauce starts to reduce and thicken a bit. Pour the sauce over the steaks and serve immediately. Thanks for your contribution. I’m glad you enjoyed the steaks!